I use GNOME and it first executes commands from /etc/profile and then from ~/.profile. This I have found by putting statements like echo 'something' > test in all files that i could think of like .bashrc, .bash_profile, .profile, /etc/profile and others. What I am curious about is to know if there is any standard file that all Desktop Managers are required to execute commands from? is there any agreement between Desktop Mangers in this regard or do they use which ever file they want. If you are trying to get a script to run on login, just add it to your startup programs (system>preferences>startup applications). Anything you add to this will be read by all 3 of the D.E. For example you could write a script in /home/username/bin, and add this to your start up programs. Not the answer you're looking for? 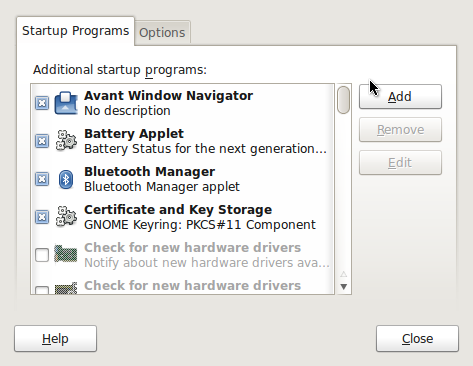 Browse other questions tagged gnome kde desktop-environments .profile or ask your own question. Are window themes on a Gnome, Unity, and XFCE desktop environment interchangeable? How can I pass gnome proxy settings via .desktop file?